Talk Nerdy To Me: The Empire State Building Turns It On ... Nightly. The Empire State Building Turns It On ... Nightly. 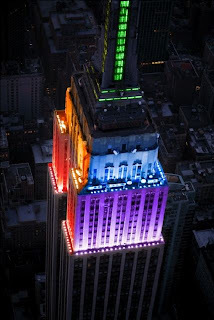 Did you know- The Empire State Building changes color every night? Floodlights were added in 1964 on the skyscraper and are changed nightly. And it's quite the treat! I love looking at it every night and trying to guess the color changes. Sometimes the colors are symbolic to special holidays or dates, sometimes it's for NY teams like the Knicks and Rangers and other times it's for unique events. After the death of Frank Sinatra it took on a blue lighting effect for Ol’ Blue Eyes. US Open in August / September turns the building all yellow for a tennis ball. In 1995 Microsoft launched a multi-million dollar campaign for Windows ‘95 and the lights took on a red blue green and yellow theme. In 2008 participation began for Earth Hour – completely turning off the flood lights. Even Mariah Carey lit up the Empire State Building in white, pink and lavender on her release of E=MC2 April 25-27th in 2008. If you're visiting click here to find what color it will be! Image from @thinkprogress twitter feed. stream nfl games game, news, kids TV, music, and every other enjoyment that you can think of. This appears to be excellent but think about be aware of is that not all provides are the same.